It’s been a while since I read Mystic, so I wasn’t at all surprised that getting back into the world with its sequel felt like a completely new experience. In a way though, that’s exactly what Mystic Dragon was going for. Seven years have passed since we last saw our protagonist Pomella, who, against all odds, had managed to best the competition and become apprenticed to the new High Mystic, despite being a commoner. But while she is proud of her achievements, a part of Pomella still wants more. She feels that her mentor, the Grandmaster Faywong, isn’t teaching her fast enough. But now, everything is about to change. A rare celestial event approaches, disrupting the delicate balance between the Mystical realm of Fayün and the mortal world of Pomella’s home. The two sides are beginning to overlap, with Fay creatures pouring through in greater and more dangerous numbers. Soon, people are disappearing or dying. Called upon to do something about the threat, Mystics everywhere are gathering for an important ritual on Moth, the small island where Pomella resides. One of the new arrivals is a young female apprentice named Shevia, whose strange power immediately draws the attention of our protagonist. With familiar echoes of the first book, the story also includes a third perspective featuring Sim, Pomella’s old friend who has spent much of the intervening time traveling as a ranger. 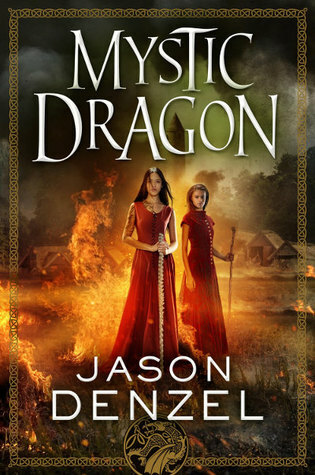 While Mystic Dragon is a sequel, there’s no doubt it was written to be a standalone so that readers can start here without having read the first book. Normally, I would be a big proponent of reading a series in order to gain a full picture, but in this case, Jason Denzel has truly made this book a perfect point to jump on board. One reason for this is the seven-year leap ahead, which makes the story feel like a bonafide fresh start. But even then, newcomers aren’t left hanging. The narrative does a superb job introducing you to the main characters and filling out their background, which includes providing a general idea of what Mystic was about and what has happened since. That said, everything that made Mystic Dragon such a great standalone also left me with a sense of wistfulness and regret. In my review of Mystic, I called the book one of the most charming fantasy debuts I read in 2015. Much of that was due to the protagonist Pomella, a pure-hearted and somewhat naïve teenager at the time, whom nonetheless refused to let her doubts get in the way of a goal that seemed impossible to achieve. In addition, many of the story’s important coming-of-age themes contributed to its charm and magic, making the protagonist’s emotions and experiences feel very relatable and genuine. While in general I enjoy seeing character evolve over time, I was taken aback by how much Pomella has changed in Mystic Dragon, which went simply beyond growing up into a more mature and confident Mystic. Of course, I was aware how different a person could become in seven years, but still—gone was the charisma I so adored about her in the first book, to the point I actually found myself struggling to stay interested during her chapters. A part of me also felt disappointment at jumping so far ahead in time, missing the many formative years Pomella had trained with Master Faywong. Needless to say, I did not expect to feel any of this wistfulness when I first picked up the book, which made the early reading experience somewhat difficult and frustrating. Happily, other characters stepped up to win my heart. Shevia was a fantastic introduction, and I loved her backstory and the role she was given to play. My biggest surprise, however, was Sim, mostly because he was a character I barely remembered from the first book, but he was given a chance to really shine in Mystic Dragon. It was fascinating to get a glimpse into some of things he’s been up to the for the last seven years, and his chapters also reminded me of many things I enjoyed about Mystic, from the imaginative world-building to the well thought out magic system. In sum, while I did stumble a bit in the early parts of Mystic Dragon, I eventually grew to enjoy it. It also bears mentioning that Mystic was a book that made a strong impression on me; whatever negative feelings I had towards this sequel, the fact that it was not the comfortable return to the familiar characters and setting I had expected probably played a role in them. Your own mileage will certainly vary, whether you are also continuing this journey or just now deciding to visit the world of the Mystic series for the first time. Regardless, I really do think Jason Denzel has written a decent sequel. Ahoy there matey. It was great to read another perspective on this book. I was startled by the jump in time. Me review be below. No pressure. That’s a great review! Totally agree with the jarring time jump. I really do find that sometimes our expectations can really color our enjoyment of something. Sequels, I think, suffer the most because of this. Still seems like it was pretty good though even if you didn’t enjoy it as much as the first one. I hadn’t really heard of Mystic, I’ll have to look it up! It’s been a while since the first book, and it’s a shame it didn’t make more of a splash because it was really good! The break between the two books probably didn’t help either. Yeah, it’s been a while since book 1! I think it’s always a gamble when an author steps away from characters that you’ve become attached too. And, wow, did you say you read the first in 2015 – that’s quite a long gap isn’t it? Yep, it’s been a few years. I think I read somewhere that the author had a bunch of stuff happening in his personal life, so the sequel was delayed.